Filipino tourist arrivals in Israel appear to be increasing, with 7,800 visitors recorded from January to May 2017. If this travel streak continues or grows, Israel might be looking at close to 18,000 visitors from the Philippines by the end of the year – an increase of about 30% from 2016. Israel Ministry of Tourism Director for India and the Philippines, Hassan Madah, presented the Filipino tourist arrival volume for the first five months during his presentation at the “Tourism Forum: Israel: One Place, Endless Possibilities” last June 30. 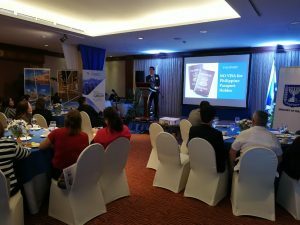 The forum at the Manila Ballroom of Marco Polo Plaza Hotel, Cebu City, was presented by the Embassy of Israel in the Philippines and in cooperation with the Israel Chamber of Commerce of the Philippines and the Cebu Chamber of Commerce and Industry. With Madah as the keynote speaker, attendees learned about the distinct beauty of the island nation and why it deserves a visit from Filipinos. As the governments of both countries make moves to fortify their tourism efforts, visitors from either side now have more and easier ways to explore the two nations. According to Madah, although there are no direct flights between Israel and the Philippines, 2016 saw an increase in flights that would link the two countries following the signing of a Memorandum of Understanding (MOU) between Philippine Airlines (PAL) and EL AL Airlines. On top of EL AL Airlines and PAL, other carriers, such as Turkish Airlines and Cathay Pacific, can transport visitors. In 2015, 11,134 tourists visited Israel and the number rose to 14,195 last year. There are myriad reasons to visit the country, which Madah outlined. His top recommendations include Tel Aviv, home to pristine beaches; the historical Jaffa Clock Tower; UNESCO World Heritage Site The White City; the Sea of Galilee, the largest freshwater lake in Israel; Capernaum, the home of St Peter and the site of two ancient synagogues; and the Jordan river. Other notable must-sees in the country are the Holocaust Museum, Timna Valley, the Red Canyon, and the Sound and Light Show at David Tower Museum. Those who are interested in experiencing Israel’s historic tourist spots and delectable cuisine will be glad to know that they offer visa-free access to Filipinos. Individuals holding a Philippine passport may travel within Israel for 90 days, given that they agree to an interview at the port of entry and they present necessary documents such as confirmed roundtrip tickets and accommodation booking.